Large vertical dial declining 36? west of south with hour lines, analemmal lines, sunrise and sunset limits, solstice lines. Metal structure mounted slightly away from brick building surface. Gnomon is a ball mounted on a rod emanating from sunburst. Visit the university of Washington web page to see this beautiful dial. A unique bronze 12-3/8 inch octagonal horizontal dial with one main hour ring for local time and six subsidiary rings that give the time in London, Vienna, Constantinople, Jerusalem, Barbados and Mexico City. The main hour ring shows hours in Roman numerals and ten minute intervals in Arabic numbers; each hour is divided into sixty minute intervals and "fleur-de-lis" decorations are placed at the thirty-minute marks. The subsidiary rings are inscribed with Roman numerals for daylight hours and Arabic numbers for night hours. The presence of subsidiary rings suggests the dial was made with an instructive or "world-view" intent. A 14 inch square brass horizontal dial with hour lines and Roman numerals, compass rose and inscriptions honoring John Barrow. 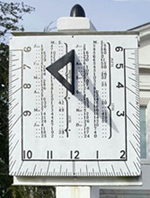 A fluted square pillar supports the dial. An armillary sphere 5 feet in diameter, with a bronze 8 inch equatorial band holding hour marks on the inside and decorated with animals of the zodiac on the outside. A simple rod serves as the gnomon. The armillary is supported by 8 cast bronze turtles on top of a four foot cylindrical pedestal. The turtles point to the cardinal and intermediary points of the compass. This very handsome dial was made by Kenneth Lynch. A bronze and well patina circular horizontal dial about 18 inches in diameter. The dial is delineated in 10-minute increments with Arabic hour numbers. Dial sits atop a plain circular column. The gnomon is plain, secured to the dial plate with four bolts. In May of 1914, a beautiful sundial was erected in Schenley Park in memory of the Pittsburgh Blues, a company sent out from Pittsburgh. To remember this event Pennsylvania Chapters including the Keystone Chapter, Old Ironsides Chapter, General Robert Patterson Chapter, and the Stephen Decatur Chapter participated in the famous grave marking ceremonies which located, honored, and decorated hundreds of graves of men who served in the War of 1812 with custom made flags and flowers. A small 8 in. bronze horizontal dial with raised Arabic numerals marking the hours. The dial is set on a massive cobble stone and mortar base suitable for sitting upon while watching the hours. A 6 foot armillary sphere on a marble column. The armillary has equatorial, meridional, polar and equatorial rings, plus two smaller ones at the poles. Along the outside of the equatorial ring are golden figures, marking the houses of the zodiac. On the inside of the equatorial ring are Roman numerals marking the hours. 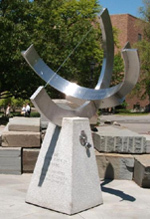 The armillary was a gift to the university on its 50th anniversary by the Miami chapter of Delta Delta Delta. Dial sits atop a marble column. A circular granite dial about 2 feet in diameter. Has an ornate, solid gnomon that looks nearly top heavy for the dial. The dial sits on a sculpted column with spreading base. Protected by brass railing that surrounds the dial in a quadrilateral monument. A 35 foot diameter horizontal dial of terrazzo with inset bronze hour lines and Roman hour numerals. 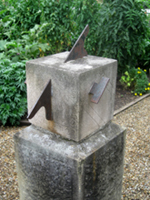 The bronze gnomon edge is 24 feet long and at the tip stands 14 feet tall. In the base of the gnomon is a circular opening, holding a large inset bronze hour glass. In the terrazzo at the dial center is an inset bronze sun graphic with wavy spicules; this inset contains a US Coast and Geodetic Survey Triangulation Station marker. A plaque gives correction for EOT and longitude. 12.75' dia. Granite with Bronze numerals 10" long. Commonly called the Washington Memorial Dial. An inscription on the octagonal base indicates this memorial is a tribute from the Daughters of the American Revolution.